The Callisto family travels through space in the Disney Junior TV show "Miles from Tomorrowland," whose first-season finale will air in March. In an episode from "Miles From Tomorrowland" — a new Disney kid's TV show about a galactic-traveling family, whose first season finale will air in March — one of the characters sees Pluto out the spaceship's window and calls it a planet. "No, it's a dwarf planet," another character says, echoing the still hotly debated consensus from an International Astronomical Union decision in 2006. To be a planet, the character continues, Pluto must be big enough to pick up other objects in its orbit, for example. One of the show's advisers, Randii Wessen, has worked at NASA's Jet Propulsion Laboratory (JPL) since Voyager 2 flew by Saturn in 1980. Science fiction fuels an interest in science, he told Space.com: A quick stroll into JPL offices reveal Millennium Falcons from "Star Wars" or posters from "2001: A Space Odyssey." "It's unfair to compare a show like this to a 'Star Trek' or 'Lost in Space,'" said Wessen, who is the lead study architect of a part of JPL that looks at coming mission concepts. While those shows feature heavy-duty science fiction, "Miles" features just a bit of science — "but not so much that it hurts somebody," he said. For example, an episode about Saturn's moon Iapetus discusses how the solar system body is half-dark, half-light and incorporates details about its surface from NASA's Cassini mission to Saturn, with which Wessen is also involved. At the same time, science is only incidental to the story of "Miles," he said. One notable break from scientific fact: characters can travel in starships going faster than the speed of light. "Miles," which premiered Feb. 6, 2015 on Disney Junior, follows the space missions of Miles Callisto and his family (including his mother, who is the captain) as they connect the universe for the Tomorrowland Transit Authority. Each episode has two 11-minute segments where Miles and his father, mother, sister and pet robot ostrich explore the universe. The season finale for "Miles" is next month and a second season is already in production. While creating the show, officials from Disney got in touch with an organization called the Science Entertainment Exchange, a National Academy of Sciences program that connects entertainers with scientists and engineers. The organization helps fuel stories with scientific fact, whether they're about nuclear reactors or space. 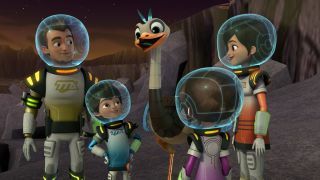 Miles and his pet robotic ostrich Merc and an alien outside the Callisto family's starship in an episode of "Miles from Tomorrowland," an animated Disney Junior TV show about a family traveling the universe. Wessen is a part of the exchange, as is John Spencer, the founder and president of the Space Tourism Society. Spencer, who also advised on the production, told Space.com the show's strength is showing people "enthusiastic about the future." To convey that enthusiasm, the show incorporates extensions of current technologies such as 3D printing — it's used to great effect in deep space on the show, Spencer says — and also space farming, which is being pioneered in real life with the "Veggie" experiment onboard the International Space Station. "Space is such an interesting subject," Spencer said, adding that "The Martian" was a blockbuster movie not only because of the science, but because of the storytelling. "What we liked in the movie was the diversity of crew members and countries helping out and all that stuff." Spencer is a well-known designer of simulated space environments and exhibits, such as the new NASA Ames Research Center Visitor Center. One of his latest projects is a planned "Mars City," which will be placed in undeveloped ground near the Las Vegas Strip. More details will be forthcoming, he said. The season finale for Disney's "Miles from Tomorrowland" will debut on the Disney Jr. app on March 11, and air on the Disney Channel on March 18.